NEMA 3 R Top Mount Exhaust Fan with Front Door Filter. 2′ legs. 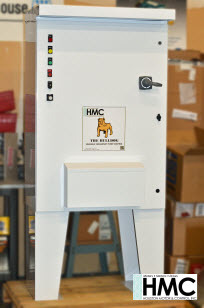 The objective of HMC’s patented technology platform, “The Bulldog” is to increase pumping unit productivity and allow worry-free operation. The Bulldog matches the pumping unit speed preventing “over pumping”. This avoids the regenerative cycle that creates an overload trip. The variable frequency pump control has a unique bus regulation, eliminating the need for resistor packs in the control panel. The DC bus regulation function allows for an optimal pump operation without tripping the VFD on over-voltage or over-current due to the pump regenerative cycle. • Simple to use speed control which prevents “over pumping”. • Ability to reverse motor rotation on a fixed-timed basis to extend the life of the overall pump stand. • PLC functions allowing users to incorporate process control and mathematical logic functions eliminating the need for an external micro PLC. 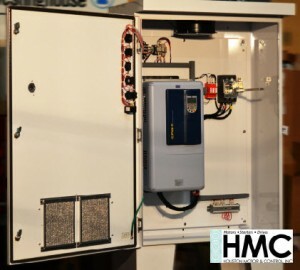 • Resistor-free pump unit panel means no more burnt-out resistors to replace. Increase pumping unit productivity and allow worry-free operation. • Auto-restart after power failure. • NEMA 3R Panel Design for outdoor use.